The Getty Villa is located in Malibu and is fashioned after an ancient Roman villa that was buried in the eruption of Mount Vesuvius in A.D. 79. 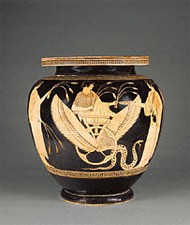 Its collections includes Ancient Greek, Roman and Etruscan art from 6500 B.C. to A.D. 400. School visits at the Getty are free and can accommodate up to 120 students. Educators can choose between self-guided visits (grade-specific activity packets are available) or guided visits on the topic of either Daily Life in the Ancient World or Mythology in Art. Subsidized transportation is available to Title I schools on a first-come, first-served basis. See the Getty Bus Funding Guidelines for more information.